A little later than intended, I am reviewing the book I mentioned in my last post. It is a book that has really helped me to begin to articulate some of my own thoughts and feelings about the nature of faith; an understanding of it that enables us to go on a faith journey that can involve exploring, questioning and changing our beliefs. 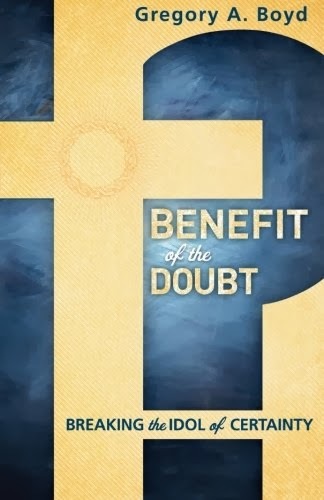 The book is Benefit of the Doubt by Greg Boyd, a writer, pastor and theologian who has been a significant influence for me over recent years (see here about how an earlier book of his affected me). He blogs at ReKnew. In this latest book he goes after a view of faith that he calls certainty-seeking faith - an attempt to psychologically convince ourselves that we are certain of our beliefs because we think that this is what God wants, this is the faith that pleases him. In an excellent chapter (10) he confronts the verses in the Bible that could be taken to mean this and demonstrates a better way of understanding them. But he also shows how this view of faith is just unbiblical in a far more fundamental way. He argues that faith should not be seen in psychological terms but in covenantal terms. It is not about our beliefs primarily but about trust in a person - God revealed in Christ; and our commitment to that person based on that trust. Although this involves belief, it is far more than that. Faith is like the 'I do' of a marriage vow and the on-going living out of that vow. This does not require that we be certain about all our beliefs but that we are 'confident enough' in the person of Jesus Christ. One of the things that I love about Boyd's approach, as with many of his writings, is the Christ-centredness of it all. From this place of trust and confidence in Christ, and his unconditional love, it is then OK to wrestle with God about the doubts and questions we have from inside that relationship. And without that relationship being threatened. This honest and trusting, 'wrestling faith' is actually what pleases God (as Boyd shows really well from Jacob and Job, though less convincingly from Jesus at Gethsemane and Calvary). From the central point of trust in 'Jesus Christ and him crucified' (because it is the Cross which presents the most stunning revelation of what God is really like), we are then free to explore our beliefs in relationship with Him. He shows this Christ-centred approach brilliantly in relation to questions we may have about the Bible and our interpretation of it (Chapter 9). And in keeping with the subtitle, he argues that seeking certainty from the Bible and our beliefs can involve us in making idols of them instead of finding our source of life in Christ - which is exactly the mistake the Pharisees made (John 5:39-40). Thankfully, his well articulated understanding of faith - that I gladly share - encourage us to journey, to explore and to change. The Theological Journey - We All Do Theology!